GREENVILLE, S.C. — A sign of the challenges Texas Southern faced in its opening round NCAA tournament game against North Carolina came during pregame introductions when the Tigers’ diminutive guard Demontrae Jefferson — generously listed at 5-feet-7 — was met at center court by Kennedy Meeks from North Carolina. Most occasions, Meeks, who’s 6-feet-10, is greeted by a player closer to his size. That explains why he laughed as he reached down and hugged Jefferson, who momentarily disappeared during the embrace. Friday’s game matched HBCU vs. ACC. No. 16 seed vs. No. 1 seed. Tight budget vs. big spenders. So the final score — North Carolina, 103, Texas Southern, 64 — wasn’t a big surprise. But it was stunning for the Tigers, who sat in their locker stalls still in their uniforms well after the game ended. TSU Tigers Ty Bynum, Dulani Robinson and Lamont Walker listen to the coaching staff in the locker room. The TSU Tigers played the UNC Tarheels in the first round of the 2017 NCAA Men’s Tournament. 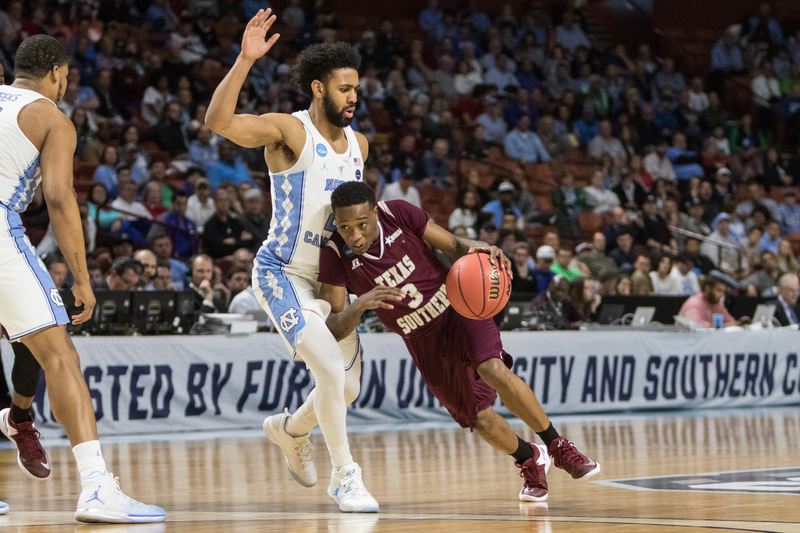 “Size was the difference, they just overwhelmed us,” said Texas Southern guard Zach Lofton, who scored nine points, well below his 16.8 average this season. “But that doesn’t mean that we didn’t have a great ride. Many wanted to see how the fast-paced game played by Jefferson, known for his YouTube videos, would translate on the big stage against one of the nation’s best teams. At times he was matched against North Carolina’s Seventh Woods, who was once declared the best high school freshman in the country in a viral video that’s been viewed more than 14 million times. Credit junior guard Kevin Scott for keeping the game close for the first five minutes as he hit two 3-pointers, giving Texas Southern a 10-8 lead. Unfortunately that would be the last lead of the game for the Tigers, although Scott did finish with a team-high 19 points. TSU Tiger Demontrae Jefferson drives to the basket during the game. The TSU Tigers played the UNC Tarheels in the first round of the 2017 NCAA Men’s Tournament. Texas Southern center Marvin Jones scored six points in what was the last game of his career. Having come to the Southwestern Athletic Conference school from Kent State, Jones appreciates the obstacles that Texas Southern and other historically black colleges and universities (HBCUs) have to overcome to reach the NCAA tournament. “At a PWI [predominantly white institution], at times you’ll have a chef preparing meals for the team, and you’re not going to find that at an HBCU,” Jones said. “From facilities to locker rooms to the facilities with the trainers, it’s just not the same. Other HBCUs have performed well as No. 15 seeds. 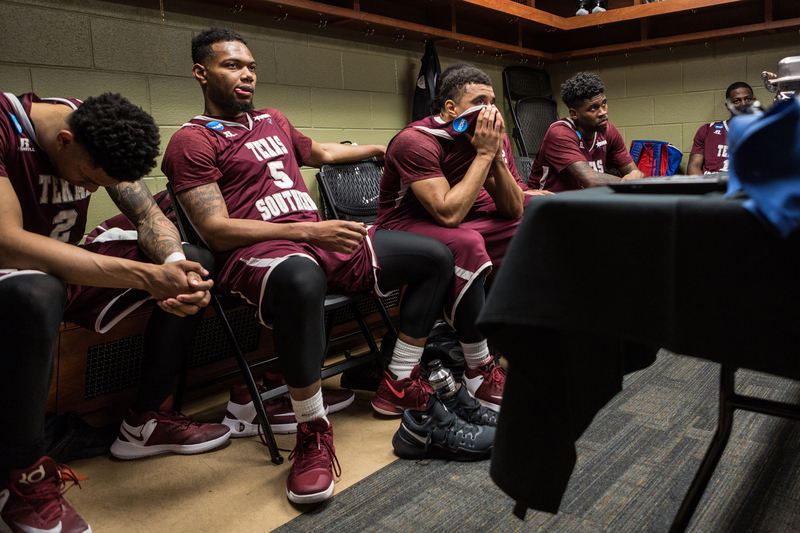 Texas Southern’s NCAA appearance on Friday came 20 years after No. 15 Coppin State beat No. 2 South Carolina in the opening round in 1997, becoming the first Mid-Eastern Athletic Conference team to win an NCAA tournament game. Since then, No. 15 Hampton’s win over Iowa State in 2001 and No. 15 Norfolk State victory over Missouri in 2012 have given HBCUs three of the biggest upsets in NCAA tournament history.